Restaurant apps allow customers to order food online is a fantastic marketing instrument for a restaurant. It makes convenient the interaction between digital and physical products to which modern customers already got used to (ordering goods online, booking hotels & tickets etc.). Companies over different industries contend that it's important to provide customers with a full-cycle service and the restaurant industry isn't an exception. A well-tailored app will act as a tool facilitating purchasing process for customers and savvy marketing step for your business at the same time. In this article, you'll find several recommendations on how to create restaurant app. Why exactly a restaurant app? Well, let's see. Technologies that surround us changed the preferences of your customers the same as conditions of doing a business along with market opportunities. When your potential customers are trying to find where to have a good meal -- they turn to their smartphones. Respectively, if your target audience uses their smartphones to search for a service you provide, isn't that mean you should concentrate on delivering them a convenient solution tailored to their preferences? By 'convenient solution' I mean exactly a mobile app since multiple studies show that smartphone users prefer them over mobile websites. You can see that statistics underneath. Another reason is that the market of restaurant apps has one of the fastest growth rates if compared to other spheres. This statement is proven by the App Annie company's research. 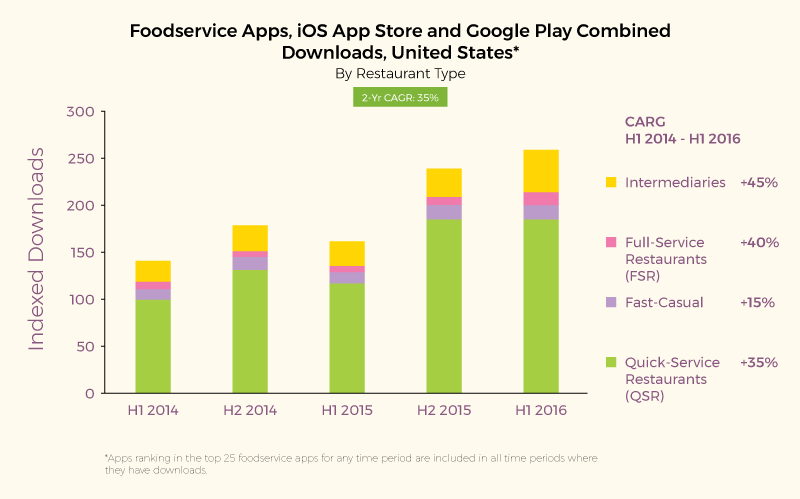 It shows that the number of downloads of restaurant apps (e.g. restaurant reservation apps) increased by 35%, while the full-service restaurants got 45% growth and those number continues growing. This fact demonstrates that the share of potential customers is exactly in the mobile segment. Here is one more interesting point in this research. There we can trace the tendency of growth in downloads if the app has features like an opportunity to choose ingredients, beforehand order and payment, exclusive loyalty programs. It indicates that customer-oriented technologies affect the restaurant industry just as any other business sphere. If you're reading this article, you probably think how to improve your business. The first point we want to highlight is that the app must solve some real problems, be it queues of visitors due to lack of seats, low conversion rates of advertising or the desire to win the local competition. That's the reason why restaurant booking apps are so popular. So, in this section, we'll consider some problems that you can solve by restaurant mobile application development. I think that you are acquainted with iBeacon technology from Apple. If not -- it's a small device by means of which you can send push notifications to your potential customers that are walking around a shop or restaurant. By means of this technology, you are able to coordinate your potential customers who don't know where to have a meal. 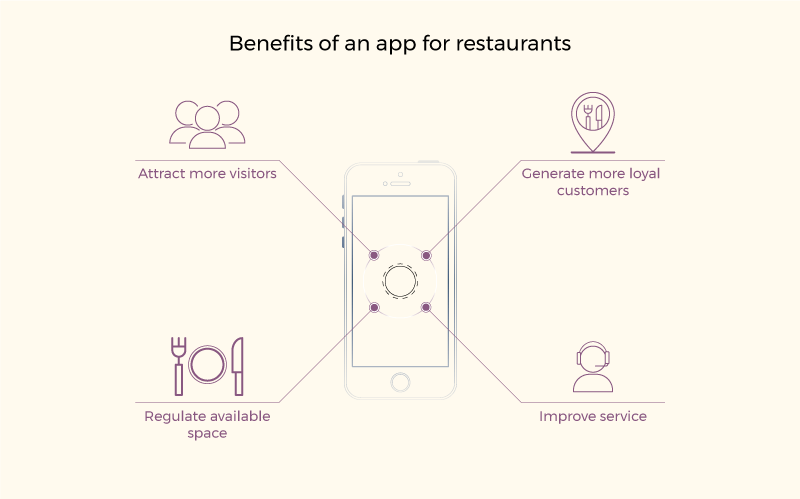 iBeacon software is only one from dozens of possible scenarios of restaurant mobile app usage. Integration of your app with other services can also be a good marketing step, but a bit later about that. One of the biggest advantages in favor of loyalty programs on mobile app is that they're much more personalized than standard discount cards given to each customer that purchased something. If you decided to build your own restaurant app, you are able to send push notification to customers for different purposes. For instance, notify customers that they are important for your company or remember them to use your loyalty program, collect bonuses or take part in a special offer. Allow your customer to book tables through the app. Restaurant app development can bring your customers an opportunity to make beforehand orders so that the personnel could serve the client's table just in time. Besides, you can display which tables are available right now and which are not. This sep will help to avoid queues in your restaurant. The opportunity to book a table without the necessity for calling somewhere has a positive impact on the interaction of your visitors with your restaurant. Especially it's clearly visible on certain days or peak hours when it is hard to book a table via phone because of hundreds of people trying to do the same. All these features increase the overall customer loyalty that almost always lead to increased profit. Satisfied and loyal customers generate additional clients by themselves. In addition, you will strengthen more on the market and tell more about your brand. It's high time for moving to the main part and learn the main restaurant app features. 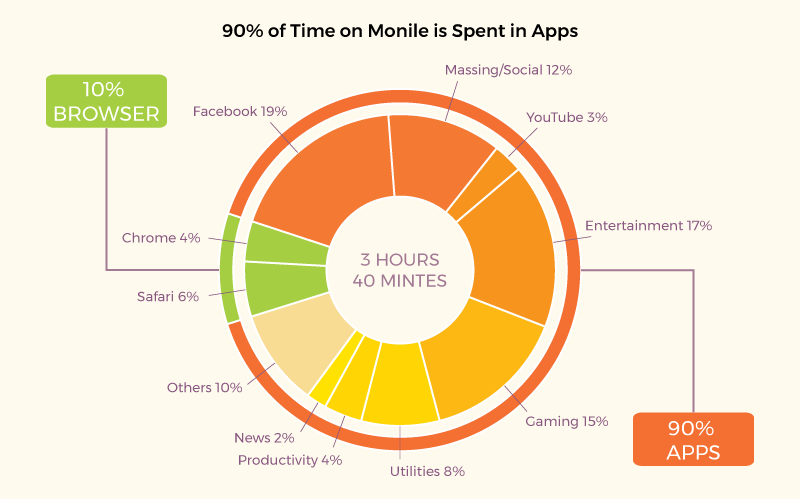 For that purpose, we've analyzed popular mobile apps from this niche that are available on App Store and Google Play. You have to convey the value of your app to your customers. To do so -- reduce the number of steps required to register. Add there the registration via any social networks or request some brief information that you really need. Too long registration process may alienate users and they will simply abandon your app after the first launch. Remember that your restaurant app design also matters. An opportunity to get acquainted with a menu is one of the most important features in restaurant apps. Let your customers explore the dishes of your restaurant, their composition, calorific value, and tell your app designers to work on the placement of an order button. It should be convenient and eye-catching. Moreover, the whole restaurant mobile app design should look great. Also, it's a good idea to highlight new dishes and special offers. Don't forget about the visual component -- use high-quality photos and take care of dishes description. Time is a priceless resource and this option will help your customers to save their time. Especially it is relevant for fast-food restaurants where clients, as a rule, wait their orders not sitting at their tables but staying in a queue. For instance, the feature of beforehand orders was successfully realized in Starbucks app. Many restaurant apps add to this feature an opportunity to choose ingredients. Also, you can make the repeated order an easier thing by saving details about previous purchases in users' accounts. If you want to implement the feature of beforehand order or delivery in your restaurant mobile application, you should take care of opportunity to pay an order through the app. Nowadays, there are a variety of ways to realize that. For example, you can integrate payment systems like Stripe or Braintree or offer customers to pay through Apple Pay or Google Wallet. A nice addition will be the possibility to pay bills separately, as well as the function of autocomplete for digital wallets. It's hard to surprise somebody with loyalty programs nowadays. However, you can show your appreciation to customers and reward them with the help of special offers and different bonuses. That's especially relevant for mobile apps since you can involve them and offer customers earn some bonuses with their help. Partner programs are a great way to grab more customers and strengthen their loyalty. Besides, it's one more way to improve your service. These programs may include various additional services or special offers corresponding to the preferences of your target audience. Let's consider several examples of integration with third-party platforms, as well as benefits it brings to you and your customers. Visitors of a restaurant will appreciate the opportunity to get there by car at a reasonable price. For instance, an online platform for searching restaurants called Zomato became partners with Uber. It allows users who found an appropriate restaurant through Zomato to call Uber right from this service. Moreover, they'll see the information concerning the cost and estimated time of journey. How can customers find you and share their thoughts about your place? With the help of Yelp and FourSquare of course! 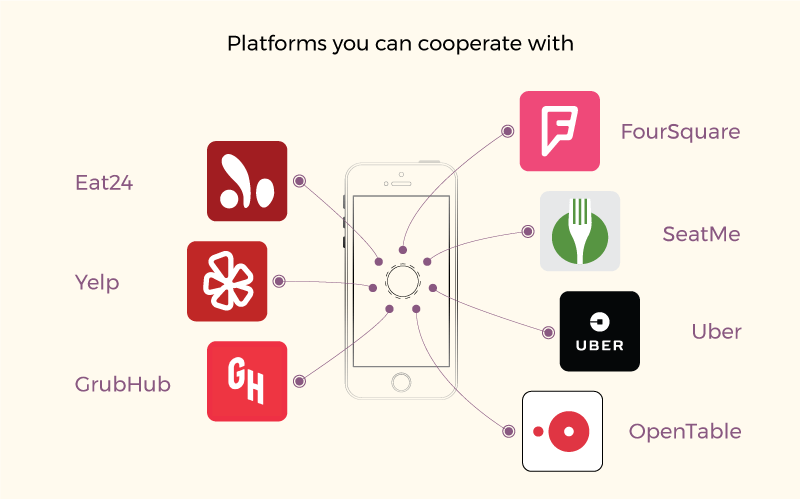 If your service is integrated with these platforms, you can send push notifications asking customers to leave a comment about your restaurant. This way, more people will learn about your business. So, that's a great way for getting feedback, as well as a viral advertising. Let's say your restaurant app already support the feature of booking a table. The reasonable question appear -- why do you need the integration with these services? That's easy. They will provide you with an additional way of attracting new customers since these services have a huge user base and advertise themselves actively. However, there is a drawback too -- for each reservation, the service charges a commission from the restaurant. Regardless of whether your business provides delivery services or not, you can integrate your application with such services as Eat24 or GrubHub. These services offer you their own couriers for delivery of your food. At the same time, an order can be done through their services. These two also act as additional marketing platforms and an opportunity to test the delivery feature before integrating it into your app. Of course, everything can look different, depending on your business model and the goals that you decided to achieve with a mobile solution. We have only suggested the possibilities of how it might look and what advantages it has to bear. In conclusion, we would like to add that restaurants over the globe have understood a long time ago that the key to success is non-trivial approaches for enriching user's experience. Contact our managers in case you are searching for restaurant mobile app developers for your business. They will answer all your questions. Also, don't forget to subscribe to our blog in order to stay tuned!